Columbia County has more than 80 members and over 20 leaders participating in 4-H.
Columbia County 4-H clubs encompass a range of project areas from cooking and sewing, to livestock and shooting sports. There is a 4-H club for every child between the ages of 5 and 19. Click on the above link “4-H Forms and Links” to access record books, online training, Quality Assurance Forms and MORE! Talk to the extension office today about enrolling in a 4-H club! “To make the Best Better”. The 4-H Columbia County Robotics team, the “Noobs” is one of the 15 teams advancing from the Tri-Cities Regional FIRST LEGO League Robotics tournaments to the Eastern Washington State Robotics Tournament in Spokane on Jan. 21, 2017. On December 10, 2016, the “Noobs” competed against tw enty-nine mid Columbia teams, comprising over two hundred and fifty students at Richalnd’s Chief Joseph Middle School. “The theme for 2016’s 11th Annual Robotics Competition was “Animal Allies” The project goal was to identify a human/animal problem and present a solution to the problem,” said the 4-H General Leader Terri Fowble. “The Noobs decided to research physiological changes and animal deaths in hot cars. For that they talked to local veterinarians Kennie and Chuck Reeves, and researched the subject online. Finding no data for animals, they studied research into children and hot cars,” Fowble says. The Noobs came up with a solution to the problem of animal deaths from confinement in hot cars. “The Dog Saver 9000 is a sensor that, when placed in a car, will send an alert, via app, to the owner’s smartphone whenever the inside car temperature is at an unsafe level for the animal,” Fowble said. 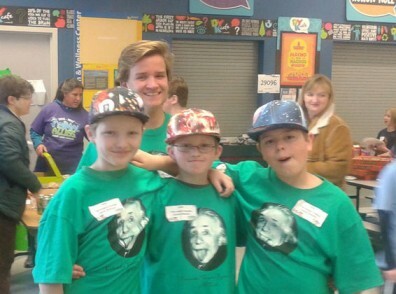 The Noobs then shared the problem and the solution with the Reeves, and with members of the newly formed Dog Park Committee in Dayton, before attending the tournament in Richland. At the tournament in Richland, the challenges were scored on a playing field, core values, the project, and for the robot executive design summary. 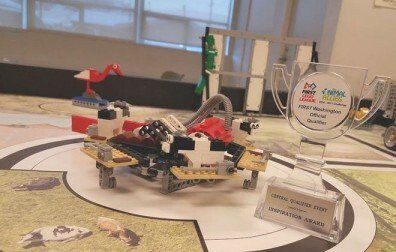 At the end of the tournament, the noobs received a special award for the core value, “inspiration” which celebrates the FIRST LEGO experience, and the team’s display of extraordinary enthusiasm and spirit. Fowble said 10 of the 4-H students, ages 9-14, began the project in August, pouring over 200 pages of instructions, before they began piecing the LEGO EV3 robot together. The robot had to be built correctly in order to perform the fifteen challenges. “They have been learning the language of programming, and that will open up a lot of avenues in the future,” said Fowble. “Its been interesting watching them work together to solve the problem, and seeing those ‘aha’ moments after rebuilding, redoing, and trying to get it right, and finally having everything click,” she said. Fowble also said that learning about the scientific process has been great for the students. “undergoing an actual competition, presenting, and fielding questions has been very empowering. It will be fun to watch the other teams, and to watch the teams help each other,” she said. The robotics competitions are sponsored by FIRST and the LEGO Group, and have as their goals to apply science, technology, engineering and math concepts, plus imagination to design and build LEGO robots to solve a problem, and perform missions, on a playing field, while practicing the core values of inspiration, teamwork and gracious professionalism.